Rather enjoyed this product. The specific changeling heritages are both descriptive and varied, much like the “Blood of Angels/Fiends” books were, with an addition to unlock more of your hag-heritage! Also, of note was an expansion on patrons, called ‘agendas’ – you can now have a patron that perhaps pays more attention to you than other witches, and include both boons and banes. There is some material about hags and covens, but it doesn’t make the mistake Blood of the Night’s mistake with dedicating player options for vampires. Informative, but short. Of the archetypes, the malice binder was very cool and interesting: a witch hunter that uses a specific magic to aid in battling their prey. It is an archetype that I would like to see have more options released in future products regarding one of its selectable class abilities (similar to new discoveries). Strong archetypes, great changeling material, cool new spells and rituals. Even the magic items section is creative, useful, and even pretty funny. 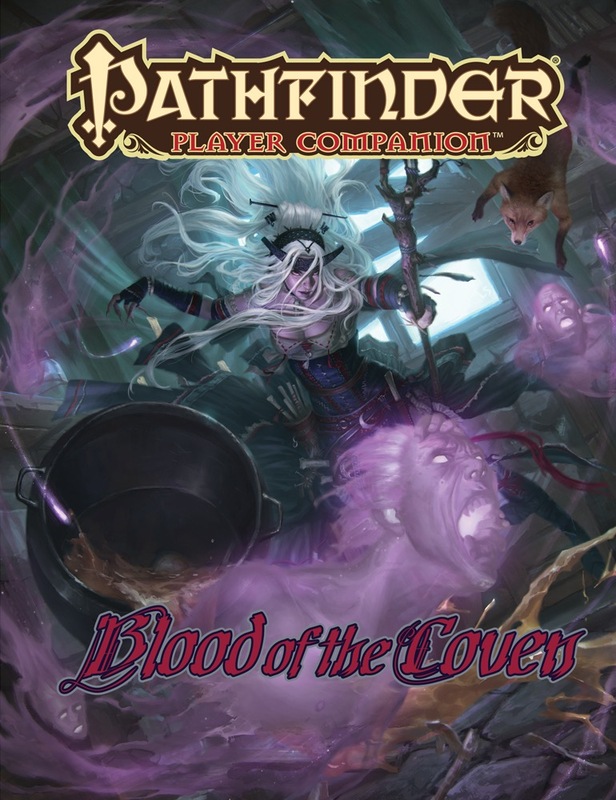 Blood of the Coven is a well-worth addition to the Pathfinder Library of both players and game masters. This Player Companion begins by expanding on the Changelings, both in terms of rules mechanics and lore. It starts off by expanding on the lore presented in the Advanced Race Guide and Inner Sea Races, and moves on to a guideline for Changelings based on non humans, and a note that the Hags with the Outsider type can also create Changelings. Changelings get some good options in this book. They received the treatment given to Aasimar, Tieflings and Skinwalkers, being given ten(!) optional varieties tied closely to the Changeling’s hag mother. Each lists a typical alignment (which is one variety of Neutral or another, except for Waker May, born from Dreamthief hag’s coven-mates, into whom the Dreamthief pours their fiendish soul). These variants also alter the racial ability modifiers of the changeling, though most have at least one or two modifiers in common with the non-speciality Changeling. Finally, the variants are each given a Hag Racial Trait, usefully collected from the various Bestiary entries of Hags, expanding the options from the Advanced Class Guide. This section is excellent, and my only real disappointment is that Slag May, Annis-born Changelings retain a constitution penalty, the only mar on them making absolutely perfect Bloodragers. Why bloodragers? I’ll get to that, but it's by no means a deal breaker. The next section covers Covens. Once more, Blood of the Covens does some very useful leg-work in collating information on hags, in this place, the specific spells which a given hag contributes to their coven spellcasting. Additionally, there are a few feats in this section: The shiner here to me is Enhanced Coven. Each changeling with the feat gains an additional 3 coven ‘slots’ per day. Next up is a fairly long section on Witchcraft. Patrons receive a set of archetypes which left you graft some spells onto your patron spell list, and at the cost of a drawback, you get a bonus hex. The drawbacks by and large are either minor or quite flavourful: the Celestial Agenda wants you to not deceive or threaten people, the Green Whispers patron forbids metal armor and inflicts minor damage in contact with metal and those whose patron is Touched By The Outer Gods are easily confused. This section also contacts three archetypes for witches, of which my favourite has to be the Hagbound. Hagbound Witches have to take the archetype as their first level, and must continue to take levels in hagbound witch until they can free themselves from the hold a hag has on their souls, slowly transforming them into a Hag, becoming an evil monstrous humanoid with several immunities and hefty spell resistance, unless she can remove the archetype with a miracle before you hit 20th level. The putrefactor gains an honorable mention for being ...thoroughly disgusting, but also an interesting take on a witch with a swarm familiar. The section tops off with three additional patrons, Jynx, Mercy and Rot. Next up is a section on curses.slightly over a bag of spells all with the curse descriptor (surprise surprise) and a few feats. The standout feat is the Latent Curse metamagic feat. For a +1 spell level adjustment, you change the target line on a spell to object touched, but the object does not suffer the effect of the spell, oh no, the next creature to touch the object does. I think that this is a legitimately amazing feat with some creative, devious uses. Hags and the Occult touches on Hagtouched implements and Hag or curse themed archetypes for the Kineticist and Spiritualist as well as a psychic discipline and hag-themed implements for Mediums, and the Arakineticist Archetype. I’m not as familiar as i should be with the occult classes, so I can’t really comment on these. And then Ritual Magic. I love Ritual magic, and I love these Rituals! Five-Generation Curse is how you get lycanthropic families. Grand Coven lets a coven gain additional members, and gain powerful effects for more members,including wail of the banshee and greater create undead. Invoke the Nemesis is an amazingly thematic spell, I believe it’s a bit let down by being a seventh level ritual that summons a creature with a CR under 4. Those who hunt is the penultimate section, and probably my favourite in the game, but then I favor martial characters. The Covenbane slayer could easily have been much too niche for consideration in many campaigns, but instead is, in my opinion a viable, strong archetype! The Covenbane slayer gains a supernatural ability to sense spellcasters, hags and creatures with SLAs, as well as recognise creatures disguised magically (“By the prickling of my thumbs, something wicked this way comes...”), Studied target expands to give bonuses against the entire coven after studying a single member, and later expands to include those bound by hive-minds or telepathic bond, an excellent extrapolation of the theme. The Hagriven Bloodrager is also amazing, gain claws, the ability to sacrifice spell slots for enhancement bonuses to both claws that stack with other enhancement bonuses, and natural armor bonus, and a free floating critical feat, changeable each day. And the art supplied for it on the previous page is excellent. Despite the con penalty on Slag-May/Annis-born Changelings, they’ve risen high on my “Play this concept” list. The Malice Binder Investigator is perhaps a step down from the un-archetyped Investigator, but contains a slew of interesting abilities, but is perhaps better suited to an NPC than a PC. (But would serve excellently in that role: Wrack is especially cool, and a fantastic way to create tension. Blood of the Coven closes up with an item section. There’s nothing essential here, but the Pactseeker’s blade is very cool, dealing bonus damage to each of a struck creature’s allies that the creature shares an active spell effect with, and the Battlepot Cauldron, which is a giant spiky pot you can use as a magical heavy mace. Beyond that, you can put up to five potions into the battlepot as a standard action each. When you hit an enemy with the Battlepot, you can free action effect that creature with one of the potions (of your choice) in the pot, very fun, I think! Also, ‘battlepot’ is just a plain fun word. This wasn’t a book I had any particular excitement for when I first saw it on the release schedule, but I thought I’d take a look, and I was very pleased with what I found. Some very cool archetypes, interesting rituals, a delightfully tricksome metamagic feat. In addition, Paizo has taken an opportunity to enshrine that while hag’s magical nature causes them to bear only female children, these children can express masculine identities or lack clearly defined sexual traits. Development leads for this book were Crystal Frasier and Jessica Price. John Compton, Eleanor Ferron, Crystal Frasier, Lissa Guillet, Elisa Mader, Adrian Ng, Mark Seifter and Linda Zayas-Palmer are credited as authors. The cover art is by Setiawan Lie, and interior art is by Kent Hamilton, Alyssa McCarthy and Benjamin Widdowson. As an enthusiast of all things hag-related, I waited with baited breath to acquire this gem. The new options give a lot of customization to witches, changelings, and coven casters. Pleased to see changeling options for the outsider hags and finally (if not a little brief) new information on hag goddesses. Interesting to see how different casters and psionics can touch upon the feats, spells, and items. Also pleased to see more classic hag homages, Curse of Dragonflies screams Spirited Away. All of the Blood supplements have been useful, and Blood of the Coven especially so! I've been looking forward to this book for months, as our current campaign has a changeling character in it, and we were hoping for more material to work with. Now that it's here I'm blown away by it; I think I can safely say this is my favorite book in the Player Companion line. This book has great options and information for changelings, hags, and witches in Pathfinder, all in about equal measure. The contributions here go beyond the rule additions however; the book really expands on what we know about hag ecology, the lives of changelings, and the role a patron plays in a witch's spellcasting career. In the case of the patrons, I finally feel like a witch's patron is as active a participant in her character as a cleric's god, which is saying something! Our game group is going to get a lot out of this book now and in the future. I'd recommend it as a steller expansion on both character options and in-game lore. Woohoo! Bring on the witches! Hah! This was a commonly requested title back in the day. I'm glad to see that hag-and-changeling fans will be getting their due here. Hope I was one of the people helping to support this book in it's making. While this isn't really my forte, I am never the less interested in seeing what is in here. Who knows, maybe something will make me want to play a witch. OOOOO! I hope Kali contributes on this one. Ahh, another reason for the season! Yes something for my changeling and witch PCs! I am so glad they chose this name. One of my favorite races + one of my favorite classes. I'm really excited about this book! Me too. We shall see. Being at level 17, my Witch is going to retire soon and I don't often play the same class twice, but I like witches so much that I don't mind if this book comes a bit late for me. Yass! I can't wait! Just hope that it's a divorce from the past "witches are bad, mkay?" of the past. It's a common complaint that pretty much every witch takes the same hexes, because there just aren't enough hexes that are not 'evil' by nature. Sure, things like 'Child Scent' and 'Cook People' need to exist because they are classics from Hansel and Gretel, those options are more for NPCs than for players, which means that... I'd say about 75% of witch content is NPC only for most campaigns. I hope there's at least one non-evil hag goddess. I actually have a witch with Child scent...she uses it find lost children and young animals to help them. I never thought of a non-evil hag goddess...but that would be awesome...though it might be hard to do. Oooo, nice choice for October. In a Dragonlance module there is a coven of hags whose alignment is N. It's never explained why, but they are all green hags who used to live in a forest who got later turned into a wasteland. They kept a green and fertile patch of land and acted as oracles. I always thought that they shifted to neutral alignment because the destruction of their homeland made them want to become protectors of the land rather than evil witches. Both of the above could work as a patron for Ash Hags and Lawful Evil Hags in general. Although I think Furcas is represented as male, not sure about Haborym, but they could also be gender fluid, which in Hell's courts, that might be useful. If I am counting correctly we have gotten 9 Hags so far, I hope we get bloodline details for all of them! I know Pit Hags are from the Tome of Horrors and would happily see them included but do you know of an example where Paizo has used them in their products? I know for sure there's one in the last book of Reign of Winter, even though she's completely irrelevant to the plot. Graeae - Don't forget to include the Graeae from Bestiary 4 page 134. Graeae form Covens, and Hags, Witches, and Graeae all count as members when participating in each others Covens. Also Changelings with Graeae Bloodline. This might be crazy but Graeae Changelings could provide the one chance for there being male Changelings. Sure they would be rare in the extreme but that could be the one loop hole. I didn't know Graeae, but they look cool. This Pit Hag even has a picture, a pretty good one I have to say. Witches aren't really my thing, but changelings have a place in an upcoming campaign I'm building so I'm interested in more options for them. So checked out the Pit Hag in Reign of Winter: The Witch Queens Revenge pg. 22 and Hopefully they will include it in a future Bestiary. There is enough changes that Paizo made to make the inclusion worth while. Also, switching the Pit Hag's alignment from CE to LE makes a lot of sense. I will definitely be getting this one. Changlings are on of my very favorite races (very close second to androids). Cannot wait. I have been waiting for this book for awhile now. I am so happy it is actually coming to life. So checked out Furcas in Hell Unleashed and he is a he and not a likely candidate to represent lawful evil hags. So maybe Haborym (if Haborym is a she or gender fluid). And really for both Ash Hags and Pit Hags, Haborym's areas of concern are probably a closer fit. I really hope there is a least a paragraph that talks about about there being a profane coven that includes Gyronna, Alazhra, Mestama, and possibly Haborym (so that lawful evil is included). One Goddess and 3 Demigoddess would be one scary coven! ...I really hope there is a least a paragraph that talks about about there being a profane coven that includes Gyronna, Alazhra, Mestama, and possibly Haborym (so that lawful evil is included). One Goddess and 3 Demigoddess would be one scary coven! All four are demigoddesses (Gyronna included). For Lawful Evil, have you read up on Mahathallah? She could be a candidate for a demigoddess worshipped by LE hags (although not exclusively). Nice idea (divine coven) at any rate! A "divine coven" would make sense for hag demi-gods. Calistria seems like she'd be a big hit among hags and witches. Lust, trickery and vengeance all fit the themes of hags pretty well. Goddesses like Lamashtu, or Desna (patron for the witch iconic), or Urgathoa, or Pharasma, could also support covens. There could be a number of different 'divine covens,' depending on the worshippers in question. ... into her cauldron. Gotcha. I seem to recall wishing for witch updates. Yay! Your bring up a great point about Mahathallah! I didn't even think about looking at the Queens of Night. I was mostly looking at who had Gods/Demi-Gods that had fire as a domain because of Ash Hags and Pit Hags. As far as Divine Covens go for witches there are lots of good possibilities. But for a Profane Coven representing Hags I think it would be great if the deities out there already representing Hags also had an evil coven of their own. Hmmm...has anyone made a complete list of all the various official Pathfinder Hags and what Hag Traits a Changeling can inherit from her mother? I really hope we get more Alternate Racial Traits and Racial Feats for Changelings in this manual. The Inner Sea Races hardcover does a good job of covering the different traits the various hag 'races' leave their Changeling daughters. I have such very very high hopes for this! Definitely a must-buy! Maybe with this & Elemental Master's Handbook, I can create an elemental witch, with focus on either earth or electricity/lightening. I am hoping that this book will fix the height discrepancy between the changeling table and description, but that may be a false hope.